Mike Wiley Productions’ work commemorates the 50th anniversary of the Freedom Riders. In 1961, the original 13 riders boarded a bus in Washington, DC bound for New Orleans via Mississippi and Alabama. They barely made it out of Alabama alive. Over the course of the next three months, approximately 300 other riders took up the mantle and followed the path of those first brave few. Mobs brutally assaulted many. Others were arrested and, instead of posting bail, chose to serve sentences in one of the most brutal prisons in the South, Parchman Farm, proving the Freedom Riders and the movement to desegregate interstate travel would not be deterred. Originally produced by the Center for Documentary Studies at Duke University and the Department of Dramatic Art at the University of North Carolina at Chapel Hill, and most recently picked up by The Guthrie Theater in Minneapolis, MN for a month-long series of performances, The Parchman Hour is a celebration of bravery and a call to action. 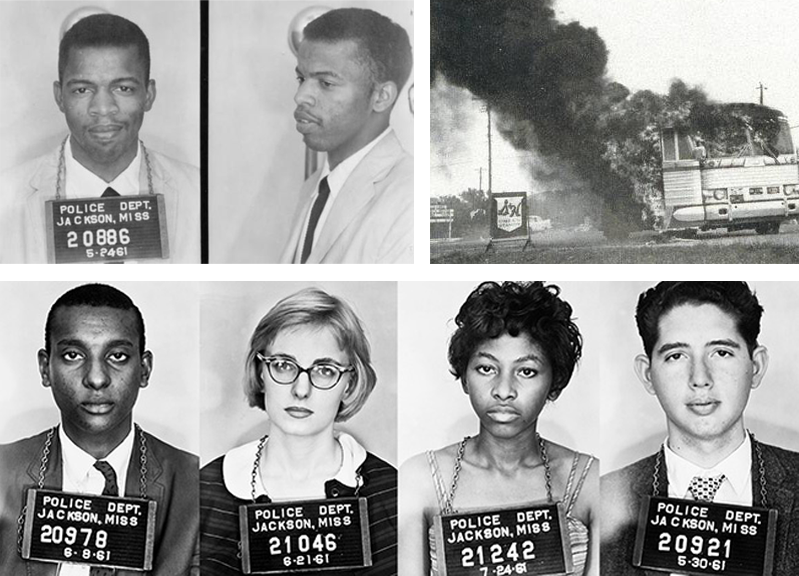 The Parchman Hour commemorates the 50th anniversary of the Freedom Riders. In 1961, the original 13 riders boarded a bus in Washington, DC bound for New Orleans via Mississippi and Alabama. They barely made it out of Alabama alive. Over the course of the next three months, approximately 300 other riders took up the mantle and followed the path of those first brave few. Mobs brutally assaulted many. Others were arrested and, instead of posting bail, chose to serve sentences in one of the most brutal prisons in the South, Parchman Farm, proving the Freedom Riders and the movement to desegregate interstate travel would not be deterred. Presented in the style of the variety shows of yesteryear, this moving production explores three of the tensest months of 1961. Production is 90 minutes in length and appropriate for a mixed audience. There is also a 50 minute student version for grades 6 and higher.